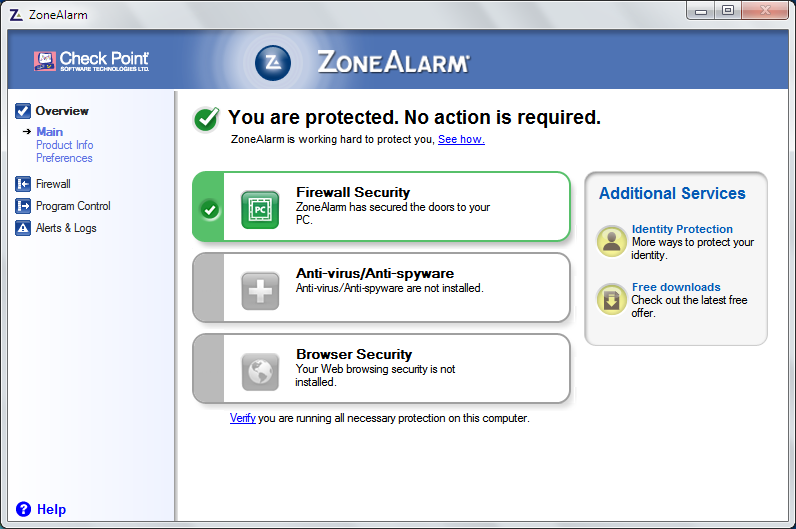 ZoneAlarm includes five interlocking security services that deliver easy-to-use, comprehensive protection. Unlike any other security utility, it incorporates a firewall, Application Control, an Internet Lock, dynamically assigned Security Levels and Zones. Combined, these elements yield the strongest security possible. this started out as a rag back in the day and protected your system from almost nothing. Conseal PC Firewall beat this crap hands down. Since then, however, with most AV software incorporating malware detection as well as the stand alone detection like MBAM, the point of this software is moot. Today the 19 of juli 2014, I contacted zonealarm about a update matter. Mr Trent did not no where he was talking about so the conversation went a little mixed up. What was going on, Mr trent ( if it is his real name ) said to me that version 131.211.000 was the latest version but I installed version 132.015.000. Zonealarm did not update my paid version so I did not have the latest stable version.This was his answer: I am sorry for the inconvenience. Unfortunately not all versions are pushed through Update. but like I stated in our last chat version 13.1.211.000 is the latest full download we have ( WRONG ). So mister Trent is wrong and is working in the wrong place! I quit using Zonealarm right now! What a waste of service and program ( guess i'm going back to Comodo ).this was the last he said: Trent M.: Is there anything else I can assist you with today? What a way to stand by a consumer!Trent M.: All right, ***, have a great day! Trent M.: Thank you for chatting with me. We welcome your feedback: please CLICK HERE to complete our Exit Survey or click the Exit Chat button. So goodbye to you Zonealarm and that thanks to mister M Trent you have a good day too. "The software is provided for Free. A lot of very expensive dollars go into developing Free security software. So in exchange for Free software we require the changing of the Browsers homepage and or browser search provider along with a toolbar." this is a perfect example of the software developers not listening to their customers. Like Chrome this post is nothing more then, the developer spamming their product. Programs like this shouldn't even be listed on here. 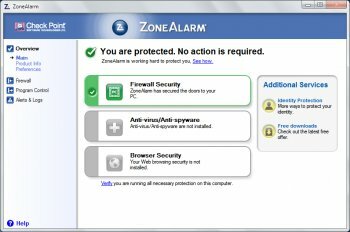 ZoneAlarm has become absurdly bloated over the last few years. What used to be the first choice for Windows users in need of a simple, fast software firewall will now slow your PC down to a virtual standstill. At the same time, they've actually removed features rather than added them. In recent builds the Network Lock and network traffic system tray icon were buggy, so the devs announced that instead of fixing the functions, they would REMOVE them altogether. When ZA users in their support forum complained about this, the thread was locked with a terse message that "no further discussion on this matter will be allowed." Almost any other firewall choice is better than the mess that ZoneAlarm has become. Agree with Hall9000, added to the fact it's all but impossible to uninstall makes it now the worst firewall in the entire world. I thought I had posted a review not so long ago and I can't find it. Must have changed my mind. Anyway, Ir is the only firewall that I wouldn't even recommend to my worst enemy. That's how bad it is. Id doesn't slow down a computer, it brings it down to snail speed. Maybe ZoneLab should check what they changed way back in 2005 because that is where the 5 star raitings suddenly dry up. I found that after installing this version (168mb instead of 2.1mb for web based off their website) the first update I ran downloaded the whole thing again. It may happen on my next update then I'll drop to 1 star and warn everyone off it. How is it that I see nothing but one star reviews and this piece of s**t still has a 4 star rating? The developers should be humiliated by this crapware. Outpost security suite free (fiirewall and anti malware) , as good as it gets for home user . Bullsh!t in its purest form.